Iran�s dissidents and exiles discover the Web. "Got a Mullah?" asks a stainless steel coffee mug for sale on the Web. Emblazoned alongside the question is a cartoon of a giant hand clenching two irritated-looking clerics who resemble Iran�s late Ayatollah Ruhollah Khomeini. One click away, a heather gray, 100-percent cotton T-shirt proclaiming "Free All Political Prisoners in Iran NOW!" features a famous image of Ahmad Batebi, an Iranian film student sentenced to 15 years for anti-mullah activities. The widely reproduced image shows Batebi�s "crime": holding aloft a bloodstained shirt that belonged to a friend beaten by regime forces. Both items -- along with lunch boxes, greeting cards, and bumper stickers -- are available to any Iranian expatriate at activistchat.com, a site that also features news, petitions, forums, editorials, and other information of interest to the Iranian diaspora. Such sites are the tools of the would-be next Iranian revolution. 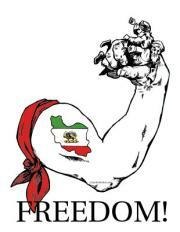 Many are produced by revolutionaries who grew up not in Iran but in Europe and North America. They communicate with their comrades however they can, surfing for any scrap of news available from within the tightly controlled Islamic Republic of Iran. Aside from their unconcealed disdain for the ruling clerics in Tehran, they are characterized by an intense nationalism and not a little intergroup disagreement over where Iran should be headed. "I cannot go into specifics," Potkin Azarmehr, director of the Campaign to Free Iran�s Students (cfisnews.com), says cryptically of his group�s work with those inside Iran. Careless communications, the dissidents explain, can trigger crackdowns, closing precious avenues of contact. "Certainly the global communications revolution has made things a lot easier," he says. "You only have to look at the areas in which the Islamic Republic has endeavored to crack down," he adds, to get clues about how the world of dissident Iranians is operating. In fact, the way the opposition communicates with students inside Iran is no great secret. E-mails, chat rooms, and phone calls to family and friends are the only near-realtime ways to find out what is going on inside the Islamic Republic. All involved are acutely aware of the fact that Iran�s intelligence and security services try to intercept such communications, with inconsistent results. Roozbeh Farahanipour, executive director of the Glorious Frontiers Party (marzeporgohar.org), notes matter-of-factly that such communications are dangerous, "because if the regime finds out, you are probably going to be executed." But for the students and their supporters, that�s a very big if. The students believe that in the long run they can defeat the regime�s security efforts. But the regime isn�t their only problem. Despite their high-tech communications, expatriate opponents of the regime face a number of low-tech challenges. Among them are competing agendas, a debilitating scramble for leadership, and a chronic lack of funds. Such challenges notwithstanding, the dissidents make daily efforts to undermine the regime. As with all authoritarian governments, the Islamic Republic�s security agencies can process only so much information about the counterrevolutionaries, and they are constrained by security requirements, financial resources, even the banal strictures of available time. The student groups know this and hope that through sheer message volume and guile they can stay one step ahead of their adversaries. Aryo Pirouznia, spokesman for the Student Movement Coordination Committee for Democracy in Iran (daneshjoo.org -- daneshjoo means "student"), observes that when the game is cat and mouse, the mice have to stay on the cutting edge. "Our site has been blocked" by the regime, he states. "But what they don�t understand is that...we are not in an age in which a country�s borders can be closed." Indeed, dissident groups have found a technological solution to their communications problems: Anonymizer. This program, which allows surfers to view sites while concealing their identities by going through an anonymous proxy server, has been a boon to the Iranian students. When the Iranian security apparatus finally catches up with them, Pirouznia explains, "We change, then they change. We change user names, we change places. We use several chat rooms now. You have the public chat rooms, which are totally monitored [by the regime]; then you have the private chat rooms, which we use." Proxy servers and chat rooms are not the only Internet-based approaches Pirouznia�s group uses. Such groups are also sending encrypted and compressed documents via U.S.-based free e-mail accounts, a tactic also used by organized criminals, terrorists, spies, journalists, and even businessmen. "Let�s imagine you have Hotmail, Yahoo, whatever, and you are in Iran," Pirouznia says. "You have several accounts. Why? Because the [Internet backbone] �belongs� to [the Iranian security services], you can�t claim, �I never went to Yahoo or Hotmail.� They say, �Here is the log. You went to it.�" But by having numerous accounts, and by using at least one of them only for apparently benign activities such as sending jokes and family gossip, the user covers his dissident communications. The other accounts, says Pirouznia, "are destroyed after a time, and you get another under another name. And all of the materials that come and go, they are all encrypted. It has become a way of life." American administrations since the late 1980s have ignored the student groups, instead pursuing a policy of unofficial dialogue with the Islamic Republic. The would-be revolutionaries� unrequited desire for attention, however, may be coming to an end. In August 2003, for example, the International Broadcasting Bureau, the agency that administers such services as Radio Free Europe, confirmed for the information technology newsletter Security Focus that Uncle Sam would give every Iranian with Internet access a free subscription to Anonymizer -- as long as the subscriber was resident in Iran. Neither the bureau nor Anonymizer will disclose how much this deal is worth, but it could total up to 2 million users. And last May, Sen. Sam Brownback (R-Kan.) sponsored Senate Bill 1082, the Iran Democracy Act, intended to reform Radio Farda (a sort of Farsi Voice of America), provide grants to other external Iranian media, and back a referendum on Islamic rule. Most observers believe the bill was meant to be a shot across the Islamic Republic�s bow. Brownback�s bill has not been signed into law, however, and further legislation is unlikely in an election year. Congressional interest notwithstanding, the dissident groups, both external and internal, are still largely on their own. The sites officially represented by Azarmehr, Pirouznia, and Farahanipour are three of perhaps a dozen that form the core of the Iranian opposition in exile�s fractious electronic vanguard. There are monarchists, socialists, constitutionalists, Zoroastrians, republicans, hard-core communists, moderate Islamists, Mossadeghists, Azeris, and other less well-defined confederations of students, aging ex-students, and businessmen distributed throughout the West. They are far from unified. Iran watchers believe that "the opposition" is a misnomer, that there simply is no unified opposition. Privately, many members of the opposition will admit as much. Why they can�t unify is a tougher question. Pirouznia attributes it to Iranian character. "We have a problem with being self-centered," he argues. "If I am a political activist, I think that everything should be channeled through me." The only times in recent memory that the expatriate opposition has even gathered around the same table have been during periods of major crisis for those still in Iran -- when the regime has cracked down on dissent. Even when they do get together, it rarely results in any significant action. Describing an "old guard" among the opposition, Azarmehr says: "One thing which seems very fashionable amongst the Iranian opposition outside Iran is signing up to charters. They gather in some hotel, draw up a charter, and put their signatures at the bottom of the charter. Then they go away and nothing further happens." Azarmehr�s point is underlined by the array of Web sites advocating alternatives to the current regime, each of which seems to have a petition or charter of its own. With some, like activistchat.com, the ideology is difficult to divine on first examination; the site espouses secularism and provides news. Others, such as the Iran National Front (jebhemelli.net), proudly proclaim, "our path is the Mossadegh path," referring to the Iranian prime minister ousted by a CIA-backed coup d�etat in 1953. Still others want to re-install a shah on the Peacock Throne. Freemyiran.com, a site that features pro-monarchist elements, offers free bumper stickers as well as flyers in Adobe Acrobat format that supporters can print out and distribute. And far from the front lines, in the suburbs of Washington, D.C., Reza Pahlavi, son of the late shah, is pushing his own political agenda with books, a Web site, and public appearances. Skirting a discussion of the troubling human rights record of the shah�s intelligence and security service, the SAVAK, rezapahlavi.org provides position papers and speeches advocating secularism and a referendum on Islamic rule. Farahanipour�s Glorious Frontiers Party advocates a boycott of Shell Oil, the Dutch petroleum conglomerate that does business with the regime. Farahanipour�s point is one pushed by many parts of the opposition: Cut off the money -- in particular the European investment that continues to support the leaders in Tehran -- and you will sever the regime�s lifeline. His site -- which features a picture of a lion holding a sword in front of a blazing sun, a favored pre-revolutionary symbol -- asks the visitor to "support Iranians in their fight against religious apartheid in Iran." Farahanipour concedes the diversity of opposition groups may be the external dissidents� undoing. "Unfortunately, each group wants to be the leader of the opposition," he says. "Most groups focus their attention on putting down other groups, so they can make themselves more credible. The majority of political groups outside Iran simply do not have any power or members inside Iran." The one factor that seems to bind the groups together is that their members all have day jobs. For the most part, funding is so scarce that they are beholden to a few meager donations from well-meaning businessmen. Despite the considerable size and relative affluence of the Iranian diaspora, the groups say funds are slow to come. Azarmehr, whose organization is based in Britain, complains: "Hardly any money comes from anywhere...Our own income last year came from one donor who gave a few hundred pounds to us to print some T-shirts with the picture of Batebi...and the sale of those T-shirts and our own individual donations has been our entire budget. We are all part-time activists and have the normal stresses of having full-time jobs." Pirouznia spins it a different way. "We are night partisans and day workers," he says cheerfully. The internal groups are finding it especially hard to make ends meet. "There is hardly any money which is being channeled to the combatants inside Iran," says Azarmehr. "We are talking about a few thousand pounds in irregular donations. Certainly compared to the financial backing that Khomeini had from some foreign sources and the Iranian bazaar merchants [in 1979], we really are talking a pittance." Farahanipour echoes this point: "We get our money from personal donations and our members. Whatever money we do receive, we simply try to pass on to our members inside Iran, or fund events to inform the public of what�s going on in Iran." To simplify the donation process, some of the groups have adopted high-tech money raising techniques. Several have signed onto PayPal and other online money transfer services. Farahanipour attributes the difficulty in raising funds to confusion about the groups themselves; he even hints at malfeasance by other anti-regime fund-raisers. "Unfortunately Iranians that live outside Iran have been lied to so frequently by the supposed opposition that they no longer believe that there are genuine opposition groups that need their donations," he says. Few, if any, of the Iranian opposition groups receive U.S. government money, at least overtly. Radio Farda, funded through the State Department, keeps the opposition groups largely at arm�s length. This suits the opposition, which takes a dim view of the State Department�s strategy of engagement with the Islamic Republic. Farahanipour scoffs that Mohammed Khatami, Iran�s reformist president, "attempted to show that a theocracy can be made a democracy, and it seems the only [people] he fooled were the State Department." The Iranian opposition groups were apoplectic when -- following a dinner in January with Mohammed Javad Zarif, Iran�s permanent envoy to the United Nations -- several members of Congress proposed an official visit to Iran. Opposition message boards around the world lit up, their participants incensed at the idea of rapprochement with the mullahs. It was spectacularly bad timing for the proposal, coming just as the Guardians� Council was disqualifying reformist parliamentarians from running in the February elections. In the end, the opposition groups needn�t have worried. Iranian foreign ministry spokesman Hamid Reza Asefi indicated that the trip was "not on the agenda," a diplomatic way of telling the American politicians they couldn�t invite themselves to Tehran so easily. The State Department and errant members of Congress are not the only such objects of scorn. The European Union is derided by many groups for its "critical dialogue" policy, which stipulates that engagement with the clerical regime can in the long run improve conditions for ordinary Iranians. "We have always had a bad experience with European countries," says Farahanipour. "If you were to draw out all the advancements the E.U.�s critical dialogue brought, you�d be hard pressed to cite three things." Azarmehr is equally skeptical of European efforts. Iranians, he says, "want the E.U. to finally admit that their policy of critical dialogue with the Islamic Republic in the last 25 years has been futile." Azarmehr observes that the Islamic Republic "still abuses human rights, still sponsors terrorism and still destabilizes peace and prosperity in the Middle East and the world despite 25 years of �critical dialogue� by the European Union countries." What the groups want from America is solidarity, especially rhetorical support from the White House in their campaign to delegitimize the mullahs. "We welcome any support, but not involvement," Farahanipour says. "When President Bush spoke of how Americans are standing with the people of Iran in their quest for democracy, that was moral support." Pirouznia agrees. "In general the new U.S. administration has understood the reality of things going on in Iran," he says. "We are asking not to intervene militarily; that would be the biggest mistake the U.S. could make. We ask for their moral support." Marc C. Johnson, a former CIA officer, is a consultant and freelance writer in Washington, D.C.
1) The article gives the impression that what we all "opposition" is a student movement. It is not. Students are perhaps the most vocal but it is a national movement. "Still others want to re-install a shah on the Peacock Throne...And far from the front lines, in the suburbs of Washington, D.C., Reza Pahlavi, son of the late shah, is pushing his own political agenda...Skirting a discussion of the troubling human rights record of the shah�s intelligence and security service, the SAVAK, rezapahlavi.org... "
Since when did Iranian nationalists, the primary victims of the Islamic/Communist Republican reaction become a minority? "Want to re-install a shah on the throne"? If this is not derogatory and demaning, I don't know what is. "Far from the front lines"? Exactly what this means in light of the context of this article I cannot fathom. It is however sarcastic and slanderous. "Skirting a discussion of the troubling human rights record of the shah�s intelligence and security service, the SAVAK, rezapahlavi.org... "
The author mentions Jebhe-Melli, an organization which not only supported Khomeini and formed the first Islamist cabinet in the newly found Islamic Republic, but continued to openly support the regime until the 7th Majless! Jebhe Melli who gave us Khomeini and the too numerous beenfits of the "Glorious Islamic Revolution" does NOT skirt discussions on its record! It is Reza Pahlavi who skirts discussions! It is Reza Pahlavi, the grandson of Reza Shah the Great and son of Mohamad Reza Shah Pahlavi who should be appologetic! Interesting, also, that Iran's counterintelligence and security service, savak, is refered to "Shah's" personal private service. Then again, this is the kind of trash one can expect from a journalist who let's himself be influenced by a few Martinis courtesy of Jenabe Farahanipour. Posted: Sat Aug 07, 2004 1:49 pm Post subject: radio farda? SHOULD WE BOW DOWN TO THE ADMINISTRATION AND THANK THEM FOR FUNDING THE NO GOOD " RADIO FARDA"? IS THIS THE BEST THEY CAN DO? RADIO FARDA? WHO'VE HEARD OF A REVOLUTION BY A NEWS AGENCY? I'VE REALLY HAD IT WITH THIS RADIO FARDA! NOT ONLY IT'S NO HELP TO US, BUT IT'S BECAME A PROMOTIONAL TOOL FOR THE SO CALLED REFORMISTS, OR 'X-REFORMISTS'! IF ANYTHING, THE ADMINISTRATION SHOULD CUT RADIO FARDA FUNDS, AND TRANSFER IT TO XTV: FOR SOS IRAN PROJECT. THIS IS OUR DEMAND. AND ITS A VITAL MOVE. SUPPORT SOS IRAN @ XTV. I think the lack of or shall i say ZERO funding we as Iranians have received from US Government has been completely unacceptable.. The article on the other hand of course has it's ups and downs, but you are forgetting that we are informed Iranians who watch this stuff daily, but the article does do much to educate those who don't constantly watch this subject. Listen, if Reza wanted to - he could be a lot more vocal, he is not. I agree with most if not everything Reza says, however - he comes and he goes, which is also unacceptable. He should not let us down and he should not waver as he does. He should be at the forefront, nonstop! The article is good because it draws attention to some of the better web sites that one may visit. "Then again, this is the kind of trash one can expect from a journalist who let's himself be influenced by a few Martinis courtesy of Jenabe Farahanipour. " I can only guess that you belong to one of these minor monarchist site who dont have the ability to see the big picture. With your simple mind you justify to insult a respectable nationalistic movement just becuase they are not aligned with your beliefs. Why dont you tell us what you mean and amuse us! who are you addressing your comments to?
. Then again, this is the kind of trash one can expect from a journalist who let's himself be influenced by a few Martinis courtesy of Jenabe Farahanipour. The author mentions Jebhe-Melli, an organization which not only supported Khomeini and formed the first Islamist cabinet in the newly found Islamic Republic, but continued to openly support the regime until the 7th Majless! Jebhe Melli who gave us Khomeini and the too numerous beenfits of the "Glorious Islamic Revolution" does NOT skirt discussions on its record! It is Reza Pahlavi who skirts discussions! It is Reza Pahlavi, the grandson of Reza Shah the Great and son of Mohamad Reza Shah Pahlavi who should be appologetic! Interesting, also, that Iran's counterintelligence and security service, savak, is refered to "Shah's" personal private service. Then again, this is the kind of trash one can expect from a journalist who let's himself be influenced by a few Martinis courtesy of Jenabe Farahanipour.. I am not questioning his view about Jebhe Melli, It is his right to express himself but to come with such comments( about Mr. Farahanipour) is just low. I am wondering about his last comment. When did I talk about C.monarchy being in majority or minority???? I agree with that Iranians want a secular state, no doubt about that. But you and I may have different approach to what might be the best thing for our beloved land. You believe that C.Monarchy is the best option I believe that a republican system is a better option. However the main point is that we want the very best for our country with secularism and freedom. Right now our country is invaded for he second time by arabs. What we need to do is to free our country and then choose the very best for Iran. However the honest and nationalistic movements need to remember that Iran lovers must stand with each other no matter of idealogy. About JM , I dont approve of JM and their actions during the revolution. To call themselves jebhe MELLI and then side with bunch of arabs is a question for me as well. Maybe this goes to the low level og knowledge of Islam during MRP. If he had let people read about Islam maybe we would have avoided a second invasion by arabs. All of this aside , It makes me very sad that some people lack the ability to see the big picture and they make stupid comment just because they are simply jelous. These people have lost the vison and the goal and tey are hurting their alike by giving them a bad reputation. In this case this guy come and make stupid comment about Mr.Farahanipour the executive director of Marze Por Gohar one of the most nationalistic and active groups around. Everyone here that are active know very well about Marze por Gohar and their efforts for Iran. 25 years of occupation and there are still people like this who dont know better and that makes me sick. President Harry Truman, a friend of Iran and Her King, and a president instrumental in saving the Azarbaijan province from Soviet annexation, once likened the presidency to playing the piano in a whorehouse. President Bush, like his predecessor, cannot expect all the numerous vested interests to �dance to his tune�. Radio Farda, as it exists, is a farce and supportive of the Islamic Republic, but asking �Who has heard of a revolution by a news agency�, as we Iranians know only too well, is surly an underestimation. Do we not remember the influence of Britain�s BBC, which aired, on a nightly basis, the speeches of Ayatullah Khomeini calling for the overthrow of the Iranian Monarchy? That�s Hooshang Amir-ahmadi of the AIC, the pro-Islamic Republic lobby, and that�s Sadegh Ziba Kalam, a Lebanese trained Islamist terrorist who is now a Tehran University �professor� and an adviser to the fascist regime. I can only hope there are some sane Americans reading this. the difference in American policies on the surface, and American policies behind the scenes, is so grave, that makes it impossible to even trust any of the promises! do we accept what pres. Bush is saying, or go by the administration's funding of pro-regime media in heart of America! "ghasame hazrate abbas ra bavar konim, ya dome khoroos ra?"